Succulent lobster boiled in salted water and served with homemade Lemon Brown Butter and Tartar Sauce! 1. Grab your largest pot and fill with water and salt at a ratio of one-half cup of salt for every gallon of water. Bring to a boil. Remove the rubber bands from the lobsters by crossing and firmly grasping the claws then easing them off. Commit the lobsters to the water. Throw in a bay leaf for each lobster. Bring the water back to a full boil, lower to a simmer and then set your timer for 5 minutes. When the timer goes, they’re done! Fish out the lobsters and rest on their backs as they cool. 1. Brown the butter by placing it in a saucepan over medium heat, heating and melting it until it begins to steam and foam. Keep a close eye on it as it foams. Swirl it gently, watching the color. When it turns golden brown and releases the aroma of toasting nuts, immediately remove it from the heat and whisk in the lemon juice and zest. 2. 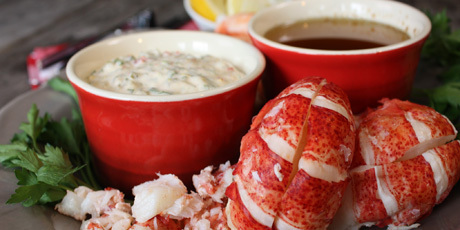 Shell the lobsters, dip in the butter or tartar sauce, share if you have to!